I have long waited for my chance to implement very own Hal 9000 (from the movie 2001: A Space Oddity), or wanted to be like Captain Picard on the Star Trek Enterprise interacting with a computer as if it were a human counterpart. Others have tried (See Apple’s Siri) but ultimately failed to provide the experience I was looking for. Is it too much to ask to be in my kitchen cooking and shout out a song or artist that I want to hear and have it instantly cue up? Or to walk in my home with my hands full and tell the lights to come on? Or how about to sit on my couch and tell my air thermostat to turn down a few degrees because I’m feeling too hot? I didn’t think it was an outrageous request either. Then, I heard about the Amazon Echo. This Amazon Echo review will examine the device in greater depth to help you determine if you should purchase it. I was skeptical when I first learned about it. I saw that they named the personality of the Amazon Echo Alexa, an attractive female name not unlike another computerized voice I’ve dealt with before. I read an Amazon Echo review or two, and watched a few videos explaining some of the features (check out this Amazon Echo review video below which I found to be pretty informative) before deciding that I needed to try this out on my own. I received mine back in the beginning of the summer and I have to say, Amazon Alexa has earned a place in my home. The ease of which to set it up. I received my Echo, hooked it up to my Wi-Fi, downloaded the Amazon Echo App. Then you choose which word you want to use to “Wake up” the Echo. I decided to stick with Alexa, although the only other option was “Amazon,” which sounded too impersonal to me. The company has said that there would be more “Wake up” words available in the future. Then I was done. Pretty simple. The Echo has 7 microphones built into the top of the unit so it has an excellent range of hearing. 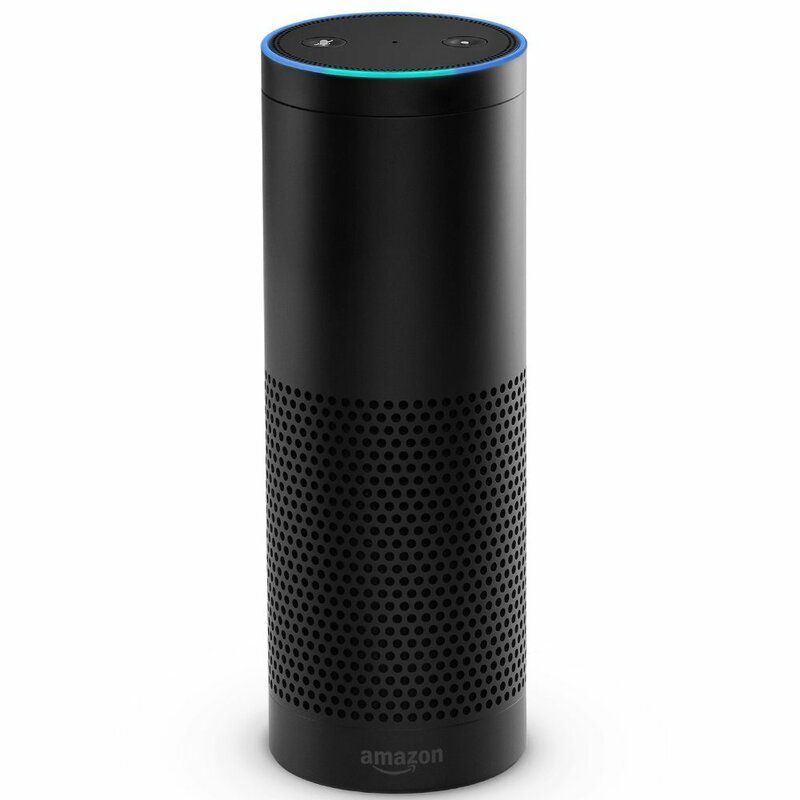 If you’re in the same room there is no need to yell your Amazon Echo commands; she’ll hear you. The only time I had trouble was if there were multiple people all talking at once. Then Alexa had a hard time picking up my request every time. The Echo can stream all music that is tied to your Amazon account instantly. Don’t have one? Pandora has recently signed on with the Amazon Echo, so that is also now available. The Echo also has Bluetooth capabilities so you can play your music collection or other music streaming services via your phone or other mobile device. Get up-to-the-minute information through online media outlets. Ask Alexa the day’s weather, top news, or sports scores. You can program the Echo to report from your personal favorite sources such as CNN, NPR, ESPN, Fox News, and more. As of now Philips Hue and the Belkin WeMo can be used through the Amazon Echo to control the lighting in your house. As stated before, other companies are currently in the process of integrating their in-home smart devices to function with the Echo. Look for these additional services to roll out in the coming months. As of my review Amazon Echo can only be purchased on the Amazon website. It is currently selling for $179.99. The accompanying remote is sold separately. While you won’t hear me say that this is exactly a must-have in my Amazon Echo review, it’s pretty darn close. I will say that the Echo is a lot of fun. If you have the money to spend on a fun and useful (but not crucial) household item I recommend getting the Echo. I spent the money on the Echo, but did not buy the remote ($29.99), the Philips Hue starter kit ($79.97), or the Belkin WeMo light switch ($37.44). So I can’t comment on how the Echo works with other products. But these items will be on my Christmas list this year and I hope to be talking to my lights and switches by years end! One thing I do have to say that I enjoy immensely is trying to find new Amazon Alexa easter eggs. This happens when you give your Amazon Alexa commands that solicit a funny or unexpected response. Being a Star Trek fan I had to make Captain Picard’s famous request: “Alexa. Tea. Earl Grey. Hot.” Her response won me over.